The Lanyang Museum in Yilan - Taiwan Ho! 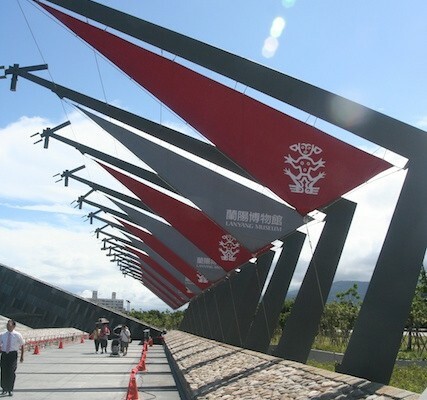 Tourism in Yilan has exploded with the opening of Xueshan tunnel. It’s now quick and easy to get to, and there are an ever increasing number of places to visit. One of the newer such places is the Lanyang Museum. 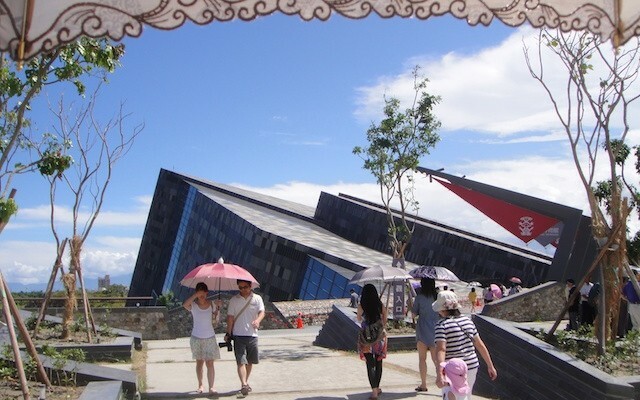 Opened in May 2010, the Lanyang Museum is all about Yilan (or Ilan as it is often also spelled), covering everything from the geology to flora and fauna to the original inhabitants to modern day. The first thing that strikes you is the building itself. It look like it has been knocked over then half submerged in mud (see the image above). 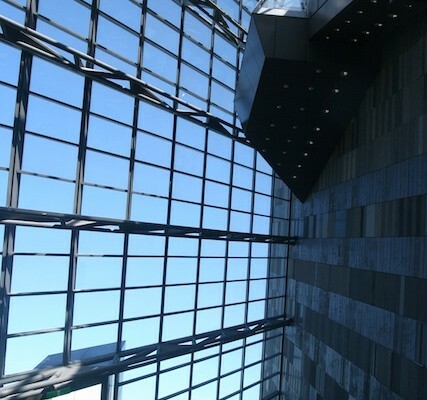 However, it is surprisingly spacious inside and very well designed. The number of people allowed to enter the museum is also limited, which may have helped in giving it the open feeling. Huzzah for that I say. 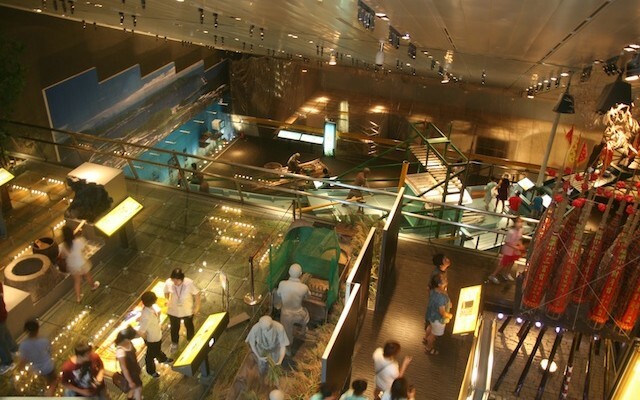 The exhibits are arranged by floor as the Ocean Level, Plains Level and Mountain Level. 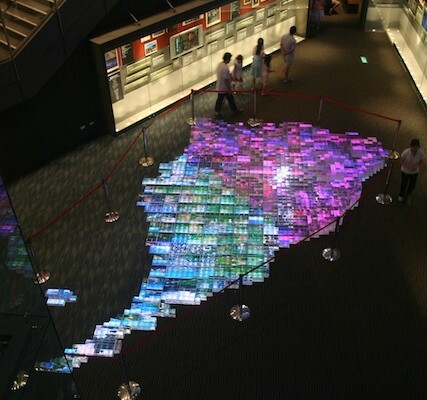 The Ocean Level focuses on Lanyang River leading to the, ocean, then explains the Kuroshio current which begins off the east coast of Taiwan (Turtle Island is clearly visible from the museum so you can link the information you read to the real world). 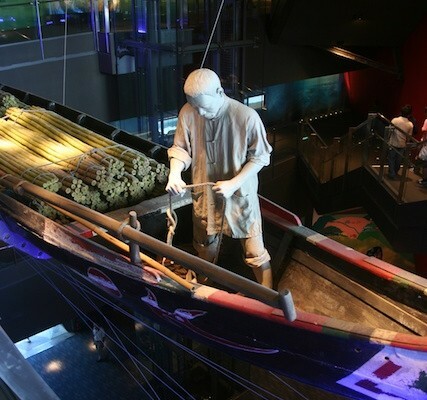 There are other ocean related exhibits, and the water theme follows into the Plains level, where the focus is more on the river and how the inhabitants of Yilan adapted to living alongside it. Head up to the Mountain Level where flora and fauna are explained in detail. I have to say the museum does an excellent job. Everything is bilingual and the exhibits are very well done. There is an emphasis on the environment and the “harmony of nature” found in Ilan. Overall the exhibits are well thought out and well laid out. Details of special exhibitions can be found on their website. Pushchairs are available, and in general the museum is child friendly. “Kid’s Land” on the first floor is intended for children aged 6-10. Overall I think you could plan for a half day at the museum and there will be enough to keep the children happy. Don’t plan to eat there though. There is only a coffee shop in the museum where you might be able to get basic food/snacks but it was incredibly slow. Either bring a picnic as the grounds are very green, or plan to eat somewhere else. Transportation is fairly straightforward and the prices are very reasonable. I don’t think you will find a better resource to learn more about what must be the fastest growing tourist region in Taiwan. Yilan Ho!